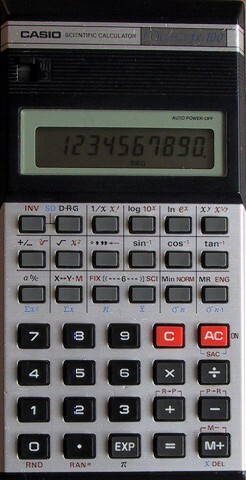 very similar in appearance and function to the fx-82 but with a ten digit display. because it has fractions, RND and RAN# it seems more like the later 82's like the 82L but yet the 82L had hyperbolics but this doesnt. other minor differences are fix, sci and norm display modes and eng simply displaying the current result in engineering notation rather than allowing repeated shifting up and down in thousands like the 82.
numeric results are similar to the later 82s. it has a very similar key layout to the fx-350, except that hyp is missing. the fx-100 line was later extended by the super-fx series fx-100d.